Try a Slumber Buddies Deluxe for free! Try for free a Slumber Buddies Deluxe from SUMMER INFANT! Create a tranquil environment for your little one at bedtime with the new Slumber Buddies Deluxe from Summer Infant. Featuring multi-colour, starry sky light displays and five peaceful sounds, these cuddly companions help relax and soothe baby to sleep. 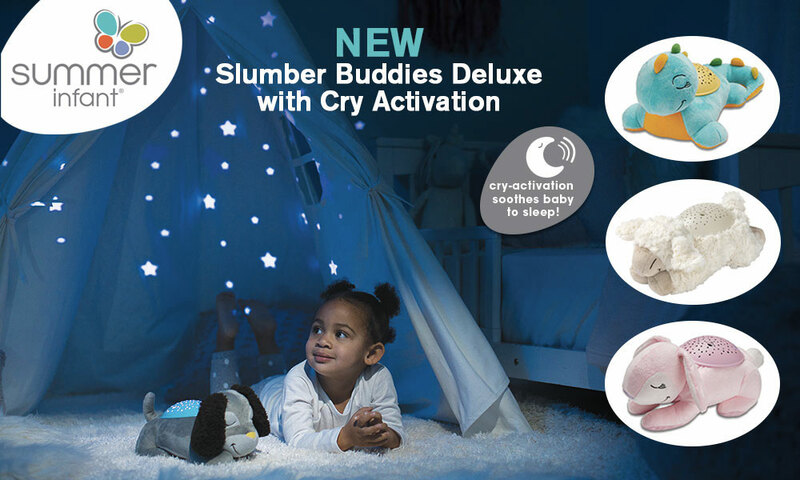 Plus they include the added benefit of cry activation technology, which automatically turns on the Slumber Buddies Deluxe when your baby becomes unsettled, helping them to drift back off to sleep without you having to go into the room. There are 5 Slumber Buddies Deluxe bedtime companions up for grabs, in your choice of 4 adorable characters (Pip the Puppy, Dippy the Dino, Bailee the Bunny and Luna the Lamb)! 5 Slumber Buddies Deluxe to try!